Get Your FREE Interview Tips Course Here! PLUS bonuses! 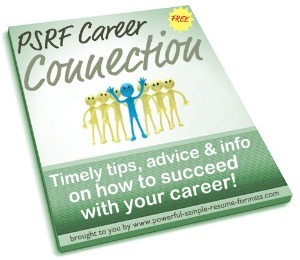 Our job interview tips eCourse is designed to help you get the jobs you want. Constructing a resume and cover letter might seem like the easy part when you submit them to job after job opening and never get the interview. Or... you do get a call for an interview, but never hear another thing afterward. But the good news is, there's hope... and it's totally FREE for my site visitors! 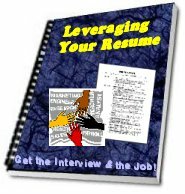 You see, I'm offering a FREE eCourse (lessons by email) about how to leverage the power of the resume you've created after studying the tips on this website in order to get AND SUCCEED AT job interviews. It's really not that hard... once you know what you're doing! And you will know what you're doing after this 10-part eCourse. Day by day, you'll get a new lesson that will help you nail your job interviews. Announcing: "Leveraging Your Resume to Get the Interview AND the Job!" I know people like you (and me) aren't so willing to just give up personal info like an email address, unless you're certain it's really going to be worth your while... so, let me make it worth your while! And last, but not least... my subscribers get the world's greatest cover letter tips from my friend, Jimmy Sweeney, one of the Web's foremost authorities on crafting killer cover letters that WILL get you the job interviews you're seeking. So, can you think of any good reasons not to fill out the short form below and start getting this value-packed interview tips eCourse – completely FREE – before another minute goes by? There's a whole world of knowledge out there, and it's yours for the taking! To protect your security, I require that you confirm your subscription to my interview tips course before I start emailing it to you. That means you not only have to fill out the form below... you must ALSO click the confirmation link in an email that should arrive in your email box shortly thereafter. If you don't click the link, you won't get any of the great stuff I've promised you!